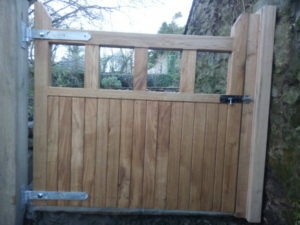 Hand made oak garden gate created for a Shani Lawrence Garden Designs garden in Pembrokeshire. Tenon and mortised oak frame with tongue and grooved boards. Treated with Osmo polyx oak oil. Hand made oak garden gate created for a Shani Lawrence Garden Designs garden. 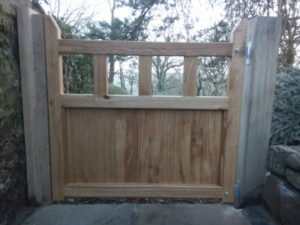 Hand made oak garden gate. 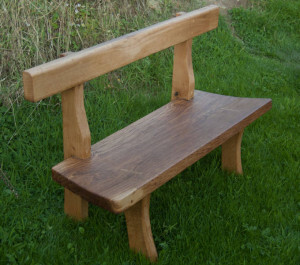 A beautiful hand made oak bench. 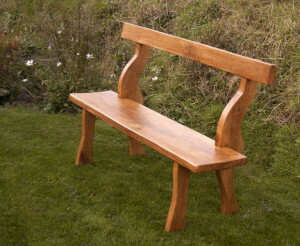 This bench has been sculpted from European air dried oak. 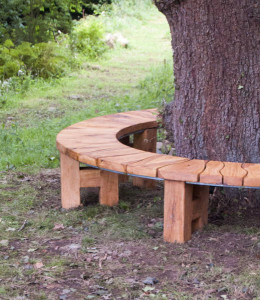 A highly durable material suited to an outside environment, this bench is built to last a long long time. With flowing lines it measures 1.5m long with a comfortable seat height of 45cm. 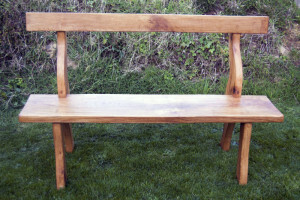 It is a very comfortable bench to sit on and is a stand out piece that will give interest to any garden. Treated with two coats of Osmo UV oil it will retain it’s colour well. As it is an oil it can easily be reapplied using a fibre free cloth or brush as and when needed, Osmo recommends doing this every 3-4 years. If left untreated it will naturally silver over time. 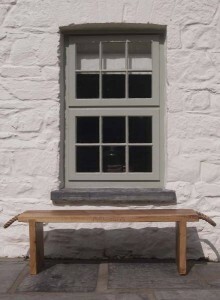 Made in Pembrokeshire West Wales by hand. 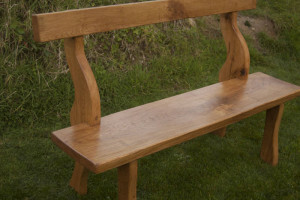 Each bench is unique and no two look exactly the same but all follow the same design and are all finished and made to the same high quality. 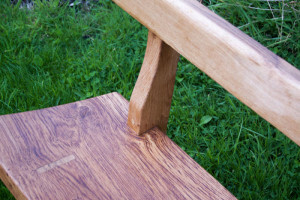 Every piece of wood I use has a different look and feel, I work with the shape of the wood and the grain patterns to produce the shapes that make these benches. 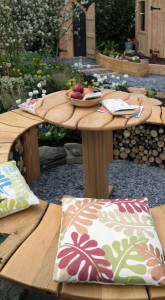 Lovely oak grain pattern on this rustic garden bench. 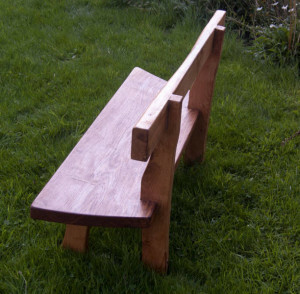 Hand Crafted Oak Garden Bench with the grain accentuated with the Osmo UV Oak protection oil. 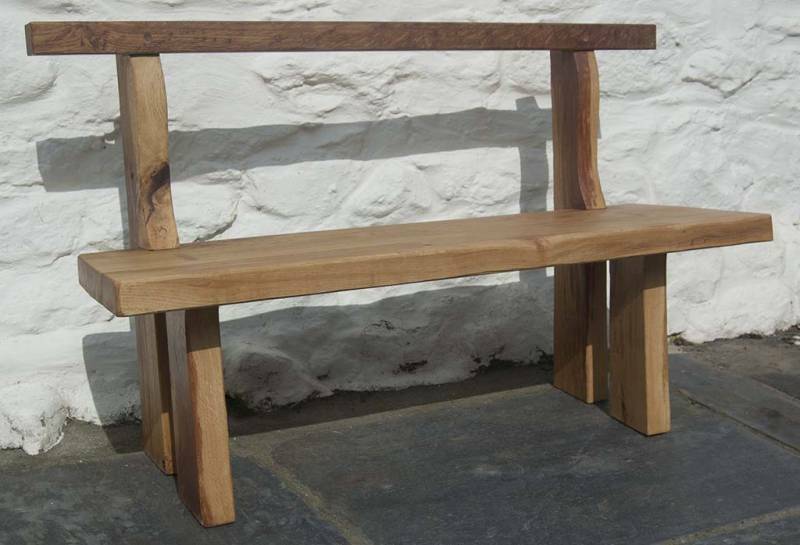 Equally at home in any garden or kitchen this beautifully crafted green oak bench has been lovingly designed and created by Made for Gardens. 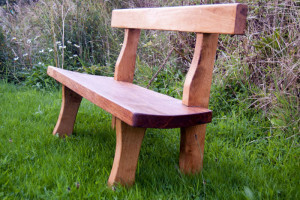 Prices for these benches start at £400 and can be made to almost any size and are available with or without a back rest. We are also happy to arrange delivery. They are very comfortable and we can make them to your exact measurments if you provide us with your buttock popliteal (distance between the buttocks and inside of the knee) and popliteal height (distance from the base of the foot to the back of the knee). Please use the contact form to for more information or call us on 01348 891344 and we will provide you with the exact price. We can also engrave them on the back rest with your choice of words. 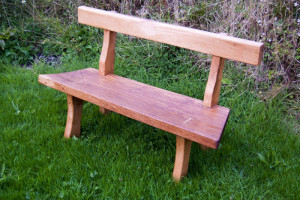 FSC European green oak bench. Number One in a set of three. 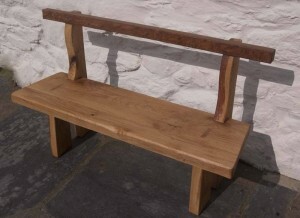 Two of a set of three solid FSC European green oak benches. This set has been designed and made for a customer in Pembrokeshire. They have been treated with Osmo UV Protection Oil which gives a nice subtle finish to the oak and should help them keep their colour. Large bench with rope handles. 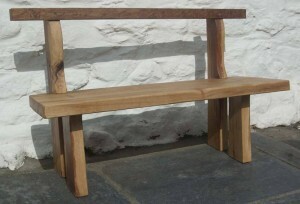 Number 2 in a set of three benches made for a customer in Pembrokeshire. 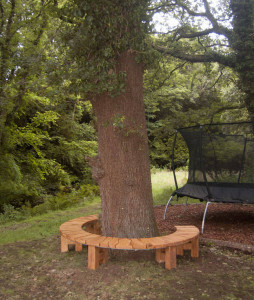 FSC green oak bench. 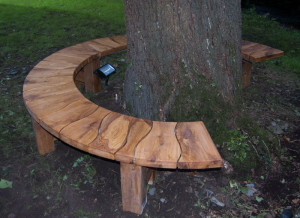 Number one in a set of three individually designed benches. 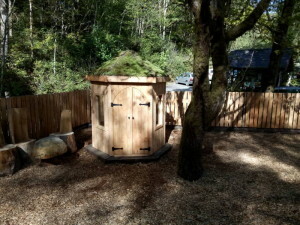 The Children’s Den that made it’s first appearence in the RHS Cardiff Flower Show 2015 show garden Made for Gardens: Nurture in Nature has settled in well in the dappled shade of the adventure playground at The Centre for Alternative Technology. Made from trees donated by CAT that was pulled by horse from their well managed woodland. The felled trees are being replanted with broadleafed species. 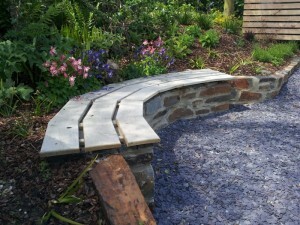 Milled on site and then processed at our workshop in Solva. 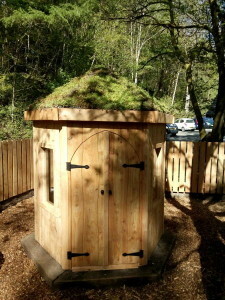 With it’s mixed species sedum roof donated by Green Roof Tops the children’s den makes a beautiful addition to the adventure playgroud whilst also provding a habitat for wildlife and inspiring children’s play. Calling all Hobbits! 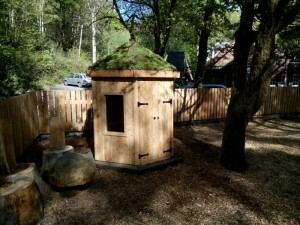 Children’s den at The Centre for Alternative Energy sitting in the dappled shade of their adventure play area. 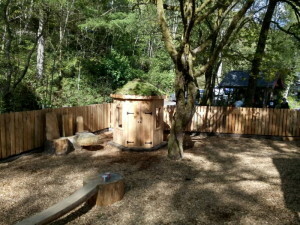 Children’s den at The Centre for Alternative Energy sitting in the dappled shade of their adventure play area. 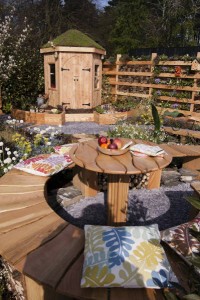 Sponsored by The Centre for Alternative Energy and designed by Shani Lawrence Garden Designs Made for Gardens won an RHS Silver Gilt Medal at the 2015 Flower Show Cardiff for their garden Made for Gardens: Nurture in Nature. 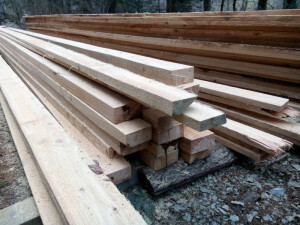 All the timber work came from seventeen trees donated by CAT which Made for Gardens then planked up and took them to their workshop in Solva, Pembrokeshire. The original seventeen trees that the the show garden Made for Gardens: Nurture in Nature was made from. 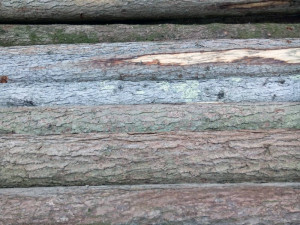 The timber sawn down from the seventeen trees from The Centre for Alternative Technology. 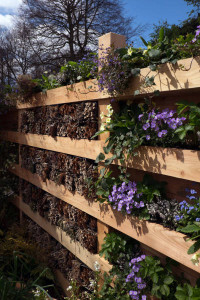 Wildlife fence planted with primroses, wild strawberries, birds-foot trefoil, forget-me-not, aubrieta, veronica and bug hotel made with bamboo and fir cones presented in reused flower pots. RHS Flower Show Cardiff. 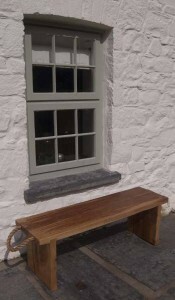 Small garden bench looking onto children’s den. 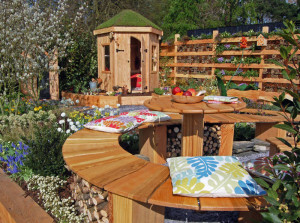 RHS Flower Show Cardiff. 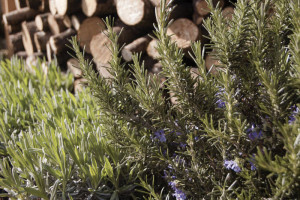 Rosemary and Lavender growing along side a log wildlife pile. 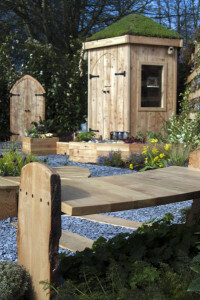 RHS Cardiff Silver Gilt winning garden,. Made for Gardens: Nurture in Nature. RHS Flower Show Cardiff. 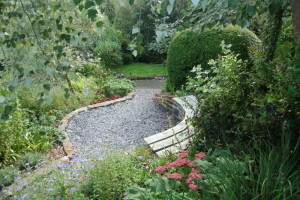 Serpentine bench winding its way towards the children’s den and wildlife fence. RHS Flower Show Cardiff show garden. 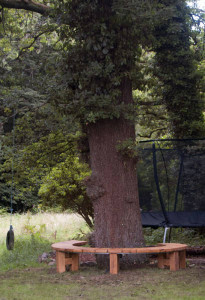 Serpentine bench and table. Cedar clad, Douglas Fir frame & larch palisade doors and red tin roof. All FSC and locally sourced wood. This shed stands in the trust owned car park in the beautiful Pembrokeshire coastal hamlet of Cym-yr-Eglwys. The large double doors hide the bins and the shed is used for a multitude of purposes. This structure was built to withstand the coastal conditions. 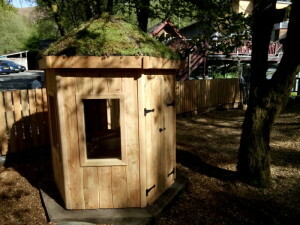 The shed frame is made from douglas fir with tenon and mortice joints, cedar cladding and a tin roof. The whole structure was designed on the computer allowing the design to be agreed with the client. The design was then used to create an accurate cut list greatly minimising waste and cost. Original design drawing made using Sketchup. The finished shed showing the boat park behind. Dan attaching the cedar cladding to the Douglas Fir frame. The shed as seen from the car park entrance. 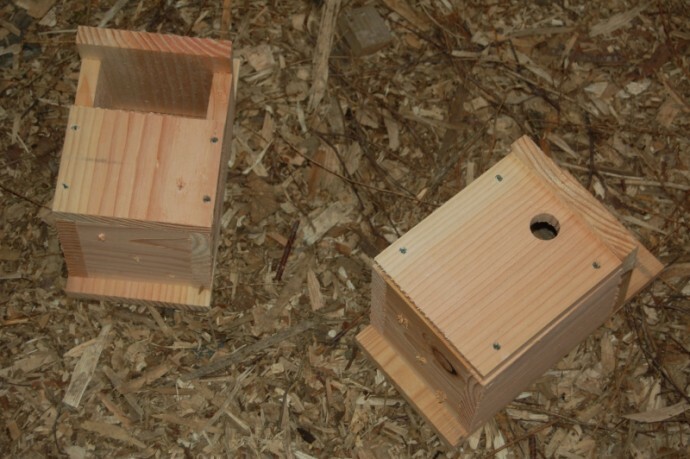 Part of a batch of 50 bird boxes for The Centre for Alternative Energy. 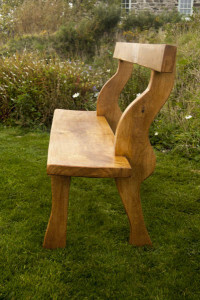 Made from larch from a well managed woodland. 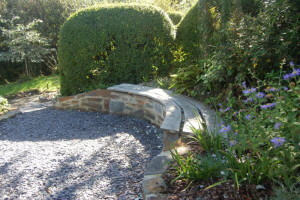 This oak garden bench top was made from FSC European oak and it sits on a blue pennant stone base which forms part of a retaining wall. 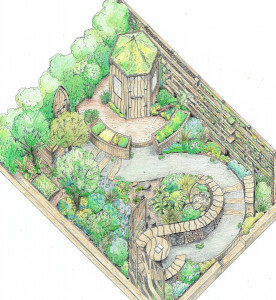 Designed by shanilawrencegardendesigns it forms part of a full garden design for a coastal cottage in Tresiath. 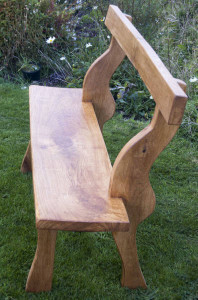 We can make oak bench tops to any shape or size. 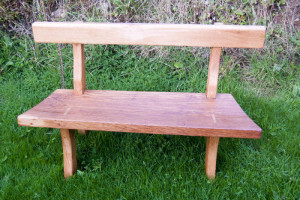 Oak is an ideal material as it is durable and requires no treatment making for a low maintenance garden bench. Please contact us for more details. Copyright Made for Gardens 2015. Website designed by Dan. Contact: 01348 891344.